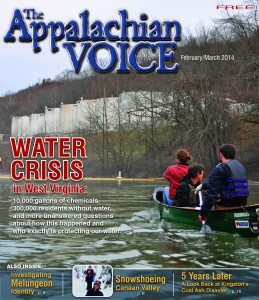 As the cover photo indicates, the latest issue of The Appalachian Voice features coverage of the ongoing water crisis in West Virginia, which began in January when coal-processing chemicals spilled into the Elk River and poisoned the water supply of 300,000 West Virginians in nine counties. In this issue, you’ll hear directly from folks affected by the spill, learn more about the event from the perspective of Appalachian Voices Water Quality Specialist Erin Savage, and read about the underlying problems with water privatization that allowed one spill to put so many residents in jeopardy. In this issue, you’ll also hear from residents of southwestern Virginia about the Coalfields Expressway, a partnership between the state and coal companies that could lead to publicly subsidized mountaintop removal mining disguised as a highway project. Adam Hall, an energetic and determined West Virginian, shares his story of opposition to mountaintop removal coal mining. And in North Carolina, volunteers and homeowners-to-be are working with a Habitat for Humanity chapter to bring energy-efficient, sustainable housing to families in need. We also invite you to shake away preconceived notions about Appalachia’s ethnic and cultural diversity with a couple of special stories that explore Melungeon identity and put the region’s current rise in ethnic diversity in historical context. You can read the online version here, pick up a copy on a newsstand near you, or join Appalachian Voices to receive a one-year subscription in your mailbox. Questions or comments? Email voice@appvoices.org, or submit a letter to the editor!